The 84th Academy Awards will be presented in Hollywood this weekend and there will be special bonuses and chances to win all week Grande Vegas Casino. There’ll be nine Oscar-themed online casino bonuses totaling $900 and the chance to get a 50% cash back bonus on Monday by using the correct bonus code, corresponding to the winning film in the category Best Picture. In the casino’s Facebook contest, players can win even more bonuses by guessing who’ll take home Oscars in any other category this Sunday. From Friday 24th until Sunday 26th Grande Vegas is offering not one, not two, but 9 Oscar-themed bonuses totaling $900. Players have been advised to check their emails or the website on Friday 24th for all the bonus codes -- all named after movies nominated for Best Picture: The Artist, The Descendants, Extremely Loud & Incredibly Close, The Help, Hugo, Midnight in Paris, Moneyball, The Tree of Life, or War Horse. On Monday, all players who redeemed and played the bonus code named after the winning film in the Best Picture category will receive a 50% cash back bonus of their deposit made with this bonus. For example, if the Oscar winner in the category Best Picture should be the film The Artist, all players who used the bonus code THEARTIST will receive their 50% cash back of the deposit made with this bonus. “We had a lot of fun and positive feedback with our Valentine’s contest on Facebook and I think our players are going to enjoy this one even more!” said Smith. Players who Join the Facebook event "Oscars 2012 at Grande Vegas" and Comment on their personal picks for the Oscars can win bonuses up to $150. 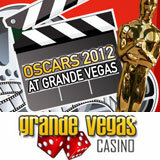 Complete details of the Oscar celebrations at Grande Vegas Casino are at http://www.grandevegas.com/oscar2012.aspx. Online casino players are invited to join others who enjoy state-of-the-art casino games and generous casino bonuses on Facebook at https://www.facebook.com/pages/Grande-Vegas-Casino/153370074692076.